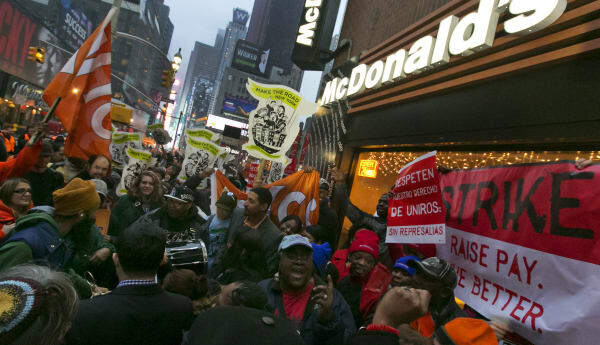 APDemonstrators outside a McDonald's during Dec. 5 strikes. The chief executives of McDonald's and Starbucks earn more than $9,200 an hour, which is at least 1,000 times the hourly wages of their sales associates, according to a new report by the personal finance website NerdWallet. The report highlights fast food and retail companies with some of the biggest gaps between CEO pay and hourly wages paid to associates. McDonald's, Starbucks and Dollar General top the list, followed by Gap, TJ Maxx, Target, Wal-Mart, CVS Caremark, Best Buy and AT&T Wireless. Out of those 10 companies, median CEO pay on an hourly basis was calculated as $7,334, compared to $8.73 for sales associates. NerdWallet reviewed 100 companies for the report and selected the 10 that had the highest annual CEO pay to compare the disparities. CEO pay was calculated by dividing each chief executive's total compensation (as reported in the company's annual proxy statement) by 60 hours a week times 50 weeks per year. Sales associates' wage information was obtained from Glassdoor.com. The NerdWallet study comes as employees of fast food and retail chains have been staging a series of demonstrations and strikes demanding better pay.